recent IT or IS degree. Replace the paragraph beginning with ?If English is not your first language?? with the following. If English is not your first language, you may register for one of several other language versions of the exam (when applicable). Or, if you choose to use the English version of the exam you may reference the translated (ISC)? Certification Acronym and (ISC)? Certification Terms glossaries, a complete list of acronyms and terms you may encounter during your (ISC)? 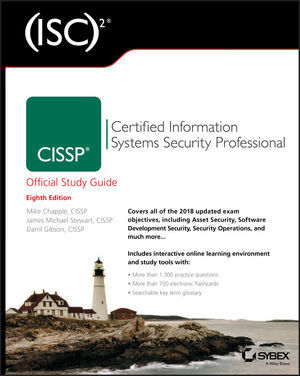 exam which is available from www.isc2.org. Finally, (ISC)? exam policies are subject to change. Please be sure to check www.isc2.org for the current policies before you register and take the exam. Under The Elements of This Study Guide. against which to implement and compare IT systems." analysis in the next section may clarify this issue. Martin recently completed a thorough quantitative risk assessment for his organization. Which one of the following risks is least likely to be adequately addressed by his assessment? invention (whether directly or via licensing agreements). Change the sentence DES-EEE3 has an effective key length of 168 bits. Mathematically, DES-EEE3 should have an effective key length of 168 bits. However, known attacks against this algorithm reduce the effective strength to 112 bits. This mode is vulnerable to the same type of attack as DES-EEE3 and, therefore, has an effective key strength of 112 bits. If an attacker is able to conduct a known plaintext attack against these two variants, the effective strength may be reduced to as low as 80 bits, depending upon the number of ciphertext/plaintext pairs available. Strike the paragraph "These four variants...equally secure." As with SSL, TLS uses TCP port 443.
statements is true about the new hash value? A. The new hash value will be one character different from the old hash value. B. The new hash value will share at least 50% of the characters of the old hash value. C. The new hash value will be unchanged. D. The new hash value will be completely different from the old hash value. sensitive data but not private, proprietary, or confidential data. sensitive data but not public, proprietary, or confidential data. (Select all that apply) after the end of the question. in the digital pattern of a monitored area." Which of the following statements are not true in regards to static electricity? A. Electrostatic discharge can damage most computing components. B. Static charge accumulation is more prevalent when there is high humidity. C. Static discharge from a person to a metal object can be over 1,000 volts. Packet sniffing and other attacks are discussed in more detail in Chapter 13. Salts add additional bits to a password before salting it and help thwart rainbow table attacks. Salting adds additional bits to a password before hashing it and helps thwart rainbow table attacks. mentioned text in upper case. tens of thousands of users, their membership is limited to a very few people. only two or three high-level administrators. Under the heading of Quality of Service. Quality of service (QoS) controls protect the integrity of data networks under load. access permissions too far in advance of a resource request. reply is discarded as being outside an open query. "Understand the various types of software license agreements." Furthermore, systems that operate in a multilevel security environment should provide adequate controls to ensure that shared memory and storage resources are set up with fail-safe controls so that data from one classification level is not readable at a lower classification level.